When I tell folks I live in Illinois but not Chicago, I marvel at the mind-blown expression spread across their faces. Inevitably, I have to gently let them down by telling them I live in (gasp) Central Illinois. That’s right, there is life outside the Windy City in Illinois, and downstate we’re working through the same real life issues facing our city-bound siblings – just add cornfields. Misinformed attitudes around HIV can be pervasive and harmful whether you live in the heart of the Chicago or a nook in the vast sprawl of Central Illinois prairies. While so much work has been done to help demystify thoughts and attitudes around HIV, it can still be hard to have the conversation in spaces where people believe that HIV is something that only happens to other people. Though, as technology makes the world smaller and easier to access, many people in rural communities are beginning to recognize that they, too, must be a part of the conversation, and leaders in those communities are stepping up to help usher in resources, services and support to make that happen. Champaign County is a bustling hub in Central Illinois. Home to the University of Illinois’ flagship campus, Urbana-Champaign is a hotspot of home-grown, grassroots community work, and the Champaign-Urbana Public Health District’s (CUPHD) Adult Services division is at the heart of those efforts. As host to one of the Getting to Zero Illinois’ town hall meetings earlier this year, CUPHD has been pivotal in making sure Central Illinois is talking about PrEP. In 2014, CUPHD recognized the need to bring PrEP efforts to the Champaign-Urbana community. 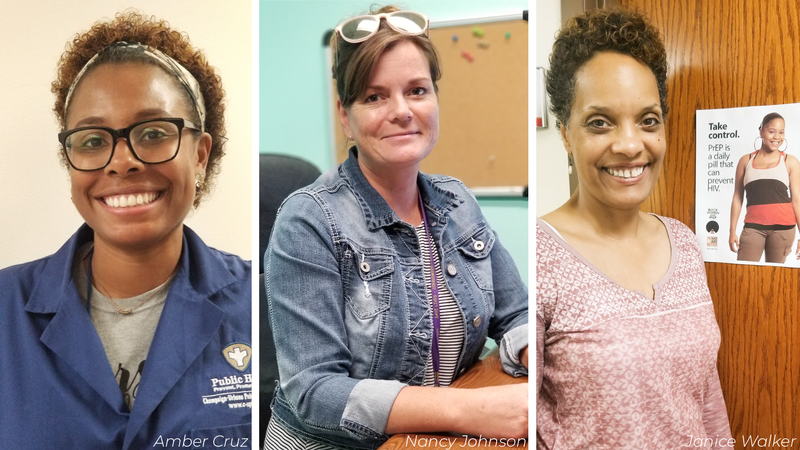 Professionals like Janice Walker, Disease Investigation and Prevention Specialist, and Amber Cruz, registered nurse and Care Coordinator, are at the forefront of that work. Walker and Cruz work directly with community members seeking health care services in their offices. While they help address various community health issues, both are passionate about helping create awareness about PrEP and its ability to help end new HIV transmissions. Living in Central Illinois is definitely different than being in the city. The view may be different from a Chicago skyline, for sure – it’s a space where your backyard may be a field of corn this summer and a soybean field the next. It’s a space where you may find people sitting on their front porch, waving to every stranger that passes. I’ve heard some people from the city say it’s just a slower way of life. Maybe they’re right. City skylines or cornfields, fast or slow… we’re all just doing our best to take care of our communities. We’re all a part of this. We’re all serious about Getting to Zero.